Comfortable trekking bike with the best equipment. 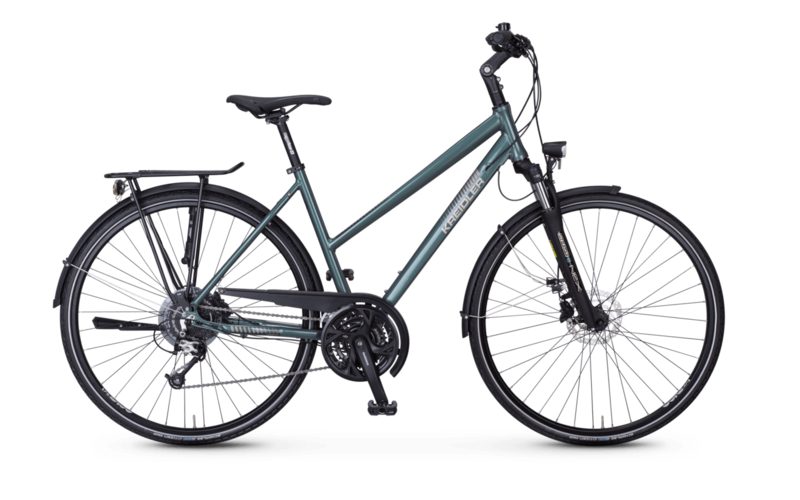 The Raise RT6 is suitable for everyday use with its top features and is also ideally suited for sporty tours in easy terrain. Despite its low weight, the aluminium frame offers high stiffness and is a real eye-catcher in its shiny grey-green in both available frame shapes! Top riding comfort is guaranteed by a high-quality Suntour suspension fork, the comfortable saddle from Velo and ergonomic handles from Herrmans - which is particularly important on longer trips. The proven Shimano Deore XT derailleur system ensures precise gear changes and is suitable for dynamic riding in the city as well as for sporty weekend tours. With its LED lighting system (parking light), Racktime luggage rack and a permissible total weight of 140 kg, the Raise TX6 is ideally equipped for leisure and everyday use.